If you have a layover in London you might just be able to squeeze in a trip to the city for a whizz around the main highlights. The key thing is to think about how long you need to move around Heathrow Airport. It takes time to get off one plane, go through customs, check luggage for the next plane, clear security again, etc. Heathrow is huge and has 5 terminals so you'll need to factor in a sufficient amount of time to move around. If you do think you can get into central London, the fastest way is via the Heathrow Express train which takes you to Paddington station in about 15 minutes. You may prefer to consider a private tour in a black cab which could pick you up from the airport and start your London tour immediately. I went out for a tour with Graham Greenglass of London Cab Tours and can recommend him. From Buckingham Palace, walk through St. James's Park which is one of London's royal parks. You can get some great photos of Buckingham Palace from the bridge over the lake in St. James's Park. 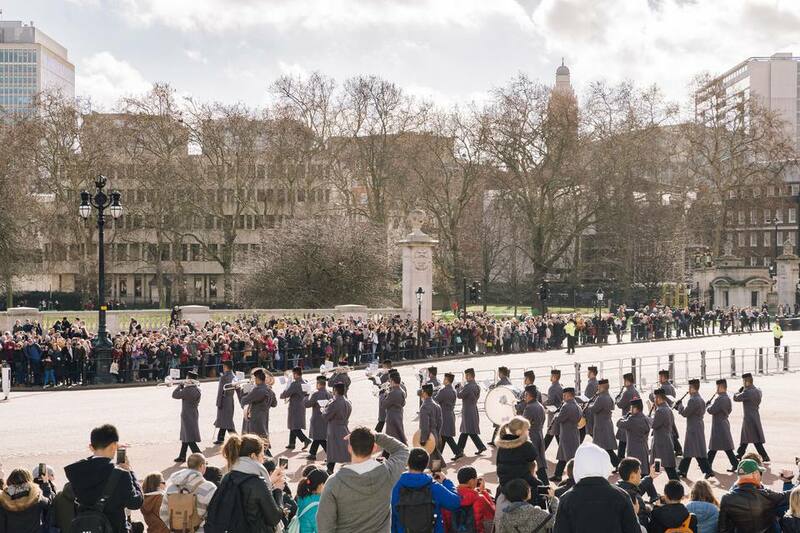 Head for the Horse Guards Parade at the other end of St. James's Park and walk through the archway to see the mounted Household Cavalry. These are part of the Queen's protection team and again, make great London photos. Walk along Whitehall, turn right halfway down and you'll see 10 Downing Street, where the British Prime Minister lives. You can’t get close but you can just see the door from pavement. Walk to the end of Whitehall and you'll come to Parliament Square. Here you can see the Houses of Parliament and Big Ben, plus Westminster Abbey. Go onto Westminster Bridge and you'll see the River Thames. Look left and there's the London Eye – an enormous observation wheel and a major landmark on the London skyline. Now, to see this much you'll need at least a couple of hours but you will have taken in some of the really important London sights. I wouldn't recommend going to the Tower of London as well as it's a bit further down the river (towards the City of London, the old part) and the entrance fee is too steep to not spend a whole day there. If you finish your whirlwind tour at Parliament Square you can go to Westminster tube station and get the Circle Line (yellow line) back to Paddington to get the Heathrow Express to Heathrow Airport. I think this would make a great introduction to London and I hope you’ll be able to give it a go. I would say always allow a little extra time for getting back to the airport than you think as tube train delays do sometimes occur. And the good news is all the things I've suggested to do here in this guide are free.